192 squared pages of acid-free paper thread bound into the hardwearing, black synthetic 'Moleskine' cover. There is an elastic enclosure and and expandable inner pocket. 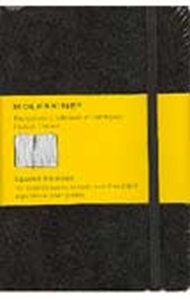 For over two centuries Moleskine was the notebook of choice for artists, intellectuals and travellers. Numbered among its fans were Van Gogh, Ernest Hemingway and Bruce Chatwin. Imagine how many sketches, notes, ruminations and secrets these discrete little black books have carried between their pages over the years. These little gems are now available as journals, diaries, address books and of course the original pocket notebook.